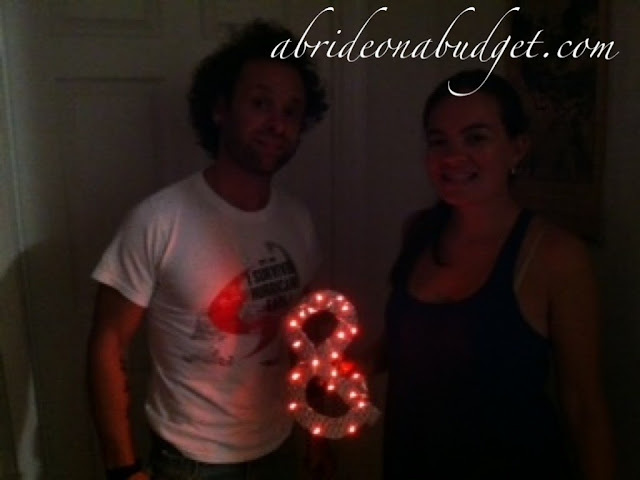 A Bride On A Budget received these lights for this review and project. All thoughts are our own. Photo booths were the wedding staple for a while. Photo booths and taking photos in frames. And with letters. I don't know when the wedding trend for marquee letters for your booth started, but I do know it can get expensive. I looked up marquee letters online (because I wanted to purchase an ampersand) and everywhere I looked wanted about $200. My mom is here to visit and she's pretty crafty. 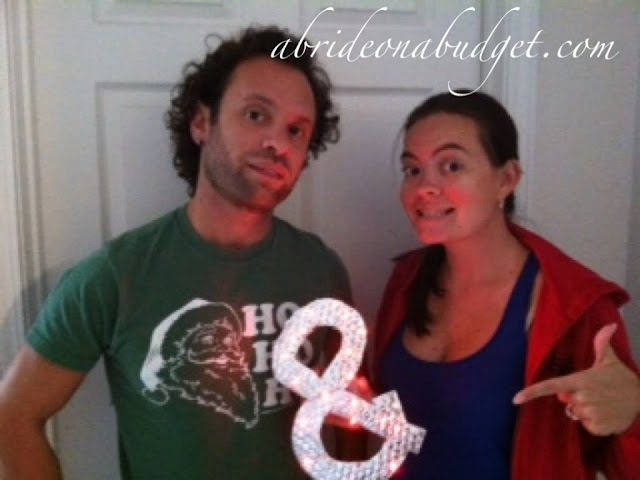 So I decided one of our (many) wedding tasks for this week would be to create a faux-marquee letter. 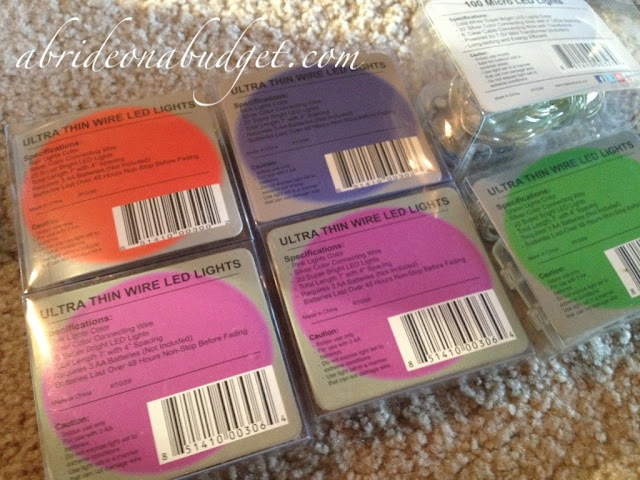 For review, we had received these gorgeous strings of lights from RTGS Products. There are two different types of lights available. There are 7-Foot Micro LED Lights, which have 20 lights tota. Those are battery operated. Then there are 30-Foot Micro LED Lights, which have 100 lights total. The longer lights are plug in and come in two variations of white. The smaller ones come in various colors, such as purple, green, blue, or white. You can definitely choose the colors based on your wedding colors. Depending on what you want to do with them will influence what lights you choose. I have a project lined up where I'm planning to adorn an old frame (which is missing the glass) with the long string of lights. We can just plug it in when we want to use it and it'll be a pretty magical focal point. 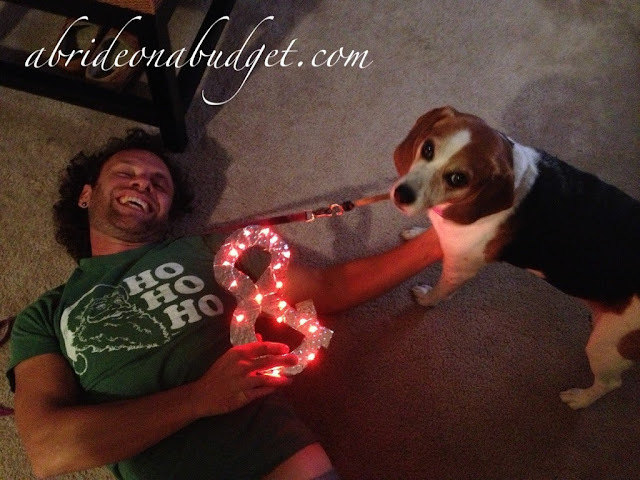 The battery-operated lights are great in that they're a little more portable. Plus, there's an on/off switch so you won't drain the battery. The battery life is quite a while, though. You could turn it on, set the lights out for an outdoor event, and they begin to illuminate as it gets darker. Of course, you can't just leave a string of lights on a table. So you have to get a little creative. 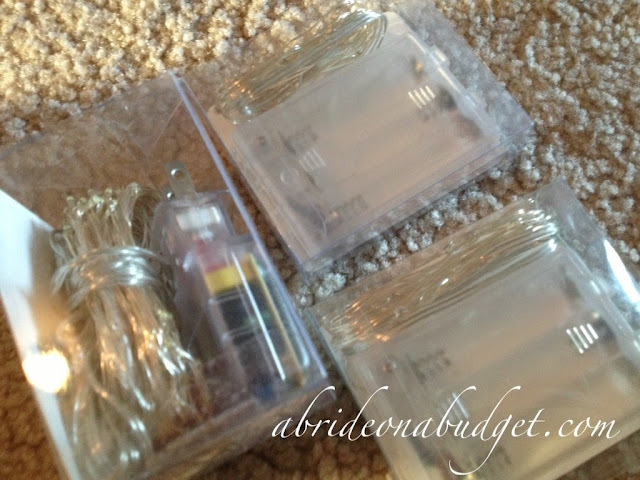 Like setting them in a mason jar or pickle jar (preferably one with a little wider bottom than what I had. I think this would be nicer if the battery pack actually sat on the bottom of the jar and then you placed it on your tables at your outdoor wedding. 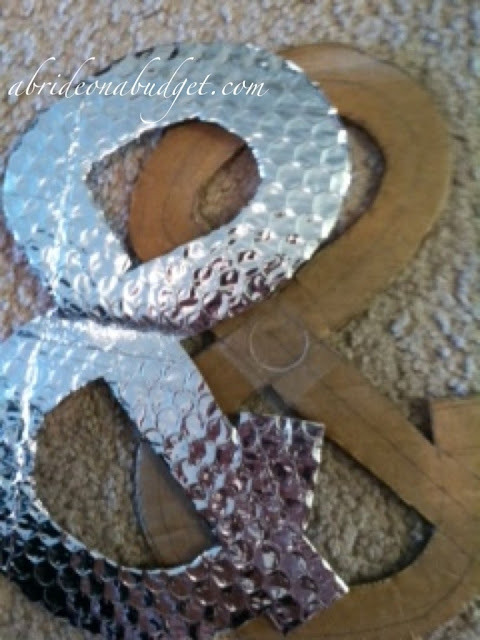 Or you can use them for the faux-marquee letters, like us. They're great for that because the string they are on is completely flexible. You can bend it however you want, and it will stay put. You probably have everything you need in your house, except the lights. So your faux-marquee letter is costing you $6.25 instead of $200. Take the $193 you're saving and go out to dinner. Or a movie. Or invite your Great Aunt Edna to your wedding now that you can afford an extra plate. 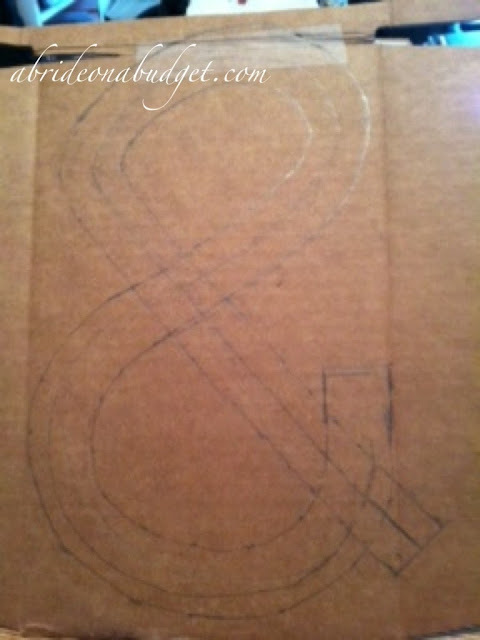 Use the pencil to draw the ampersand (or whatever design you'd like) on the cardboard. Pencil is best in case you make a mistake. Cut out the symbol. Don't worry about the lines. You'll end up covering them in two steps. 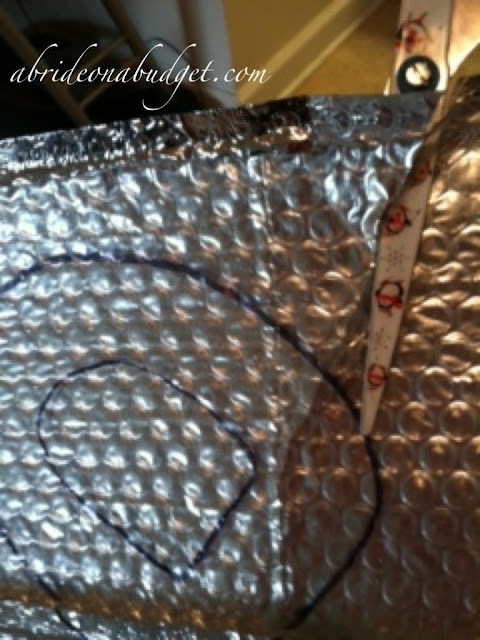 Trace the symbol onto the bubble mailer with the pencil (sorry for the blurry photo. I left my mom in charge and she got a little shaky trying to pose and snap). Cut out the symbol from the bubble mailer. 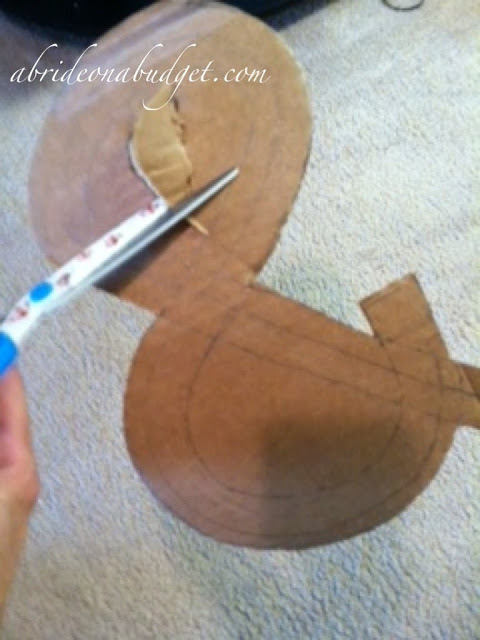 Affix it to the cardboard using Glue Dots or tape (or both, as it seems in our case). Wrap the lights around the symbol. What we ended up doing was taping the lights on the back, just to make sure they would stay in place and wouldn't get ruined from usage. 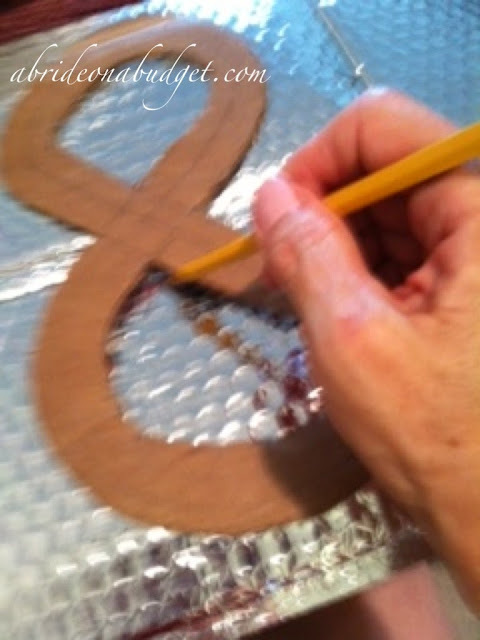 We also taped the battery box to the center of the ampersand. It gives guests somewhere to hold -- and it's the perfect way to hide the battery box. Like us using it in the light (okay, it was a little too light to actually see the red string of lights, but they did bounce off the silver, which was key). We used it again when it was darker (same night, even though Pete had a different shirt and I lost my sweatshirt). And, even though you can't really see me in the photo (which may be more the fault of the photographer, not the lighting), you can absolutely see the ampersand. You don't have to use this for human couples, and you don't even have to use this symbol. We have plans to make an L and P and adorn them with purple lights so we can have L&P at the lounge in our reception hall. You can make a heart, your name, whatever you can cut. Unless you aren't that crafty. You can still have this. Instead of making the letter from cardboard, you can just purchase a wooden letter. 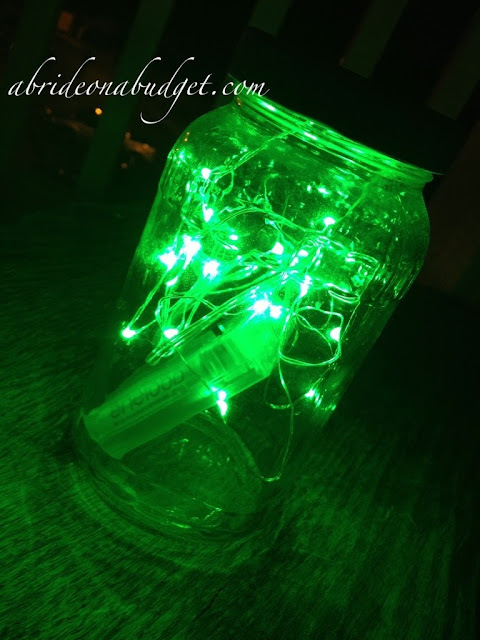 Paint it any color (I would suggest using a metallic paint) and string the lights around it. We absolutely love how this came out. I'm sure you will too. 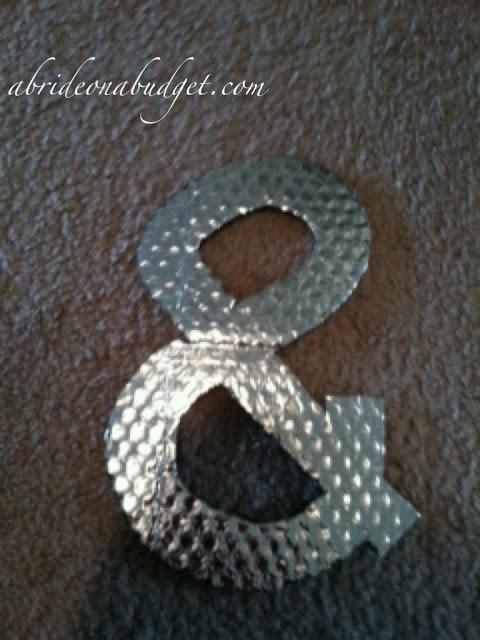 BRIDAL BABBLE: If you made these, what letter(s) or symbol(s) would you make? This is such a cool idea! Thanks for the awesome creative idea. I will keep this one in my favorites for ideas later. This is a great idea! 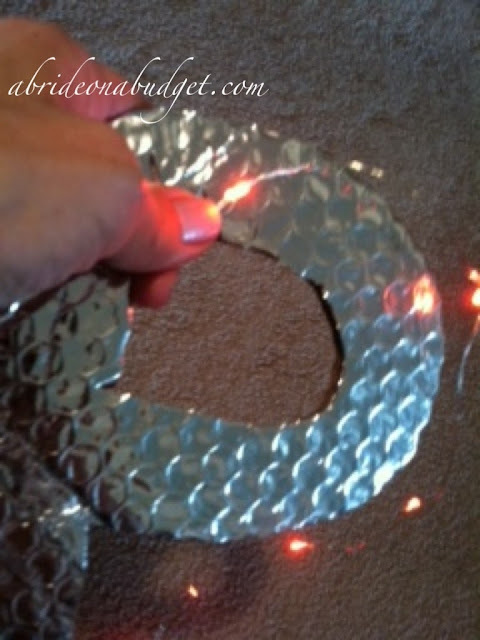 It is amazing what you can make at home and in the meantime save you tons of money. 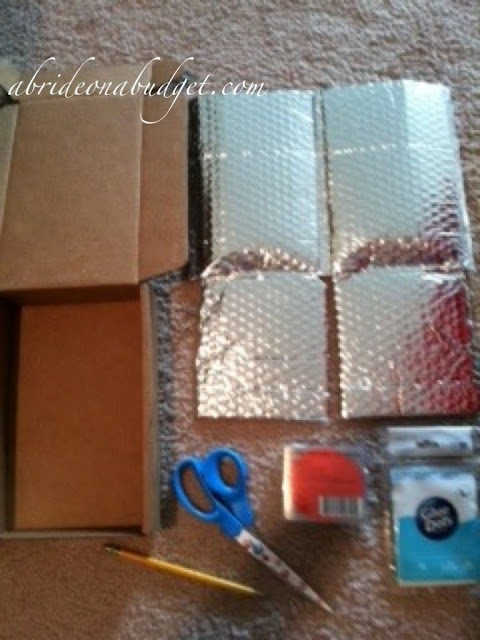 If you are crafty person you can make so many things yourself without spending a fortune. Love it!! Such a cute idea. I love that this is something you can make with not a lot of money. DIY is where it's at! :) Thanks for the idea. This is so cool! I wish I had done something like this at my reception! I bet it is going to look fantastic, and I cannot wait to see the pics! So creative! How neat!!!! I'll be trying this out for sure! You could simply do the word LOVE as a gift to the bride and groom on their day!